We just finished a really -sensational- conference here in San Juan over the weekend showcasing Puerto Rico… with all of its challenges and opportunities. We’ve talked about this before– Puerto Rico is an attractive place to live and do business thanks to some forward thinking tax incentives which stem from its unique status as a US territory. All US territories, including Puerto Rico, American Samoa, US Virgin Islands, etc. are technically part of the United States. But unlike the 50 states, US territories have their own tax systems and are NOT subject to US federal income tax. So whereas a resident of California will pay BOTH California state income tax as well as US federal income tax, a resident of Puerto Rico (in most cases) will ONLY pay Puerto Rican tax. Until a few years ago there was very little difference; tax rates in Puerto Rico have traditionally been VERY high, so no rational person would have moved to the island trying to avoid taxes. Then, in 2012, the Puerto Rican government began passing a series of tax incentives; the most famous of them are Acts 20 and 22, though there are many more. Act 22 allows qualifying individuals to move to Puerto Rico and pay 0% tax on certain investment income. This is perfect if you’re an investor, trader, or possibly even a crypto speculator. You can buy and sell securities and pay 0% capital gains, living in Puerto Rico TAX FREE. And because you’re domiciled in Puerto Rico, you’ll owe no tax to the IRS either. The other one is Act 20, under which entrepreneurs can move to Puerto Rico, set up a qualifying business, and be subject to a corporate tax rate of just 4%. And if you’re domiciled on the island, dividends that you pay to yourself are tax free… which means your effective tax rate on corporate and dividend income altogether is just 4%. Several years ago I was skeptical of these incentives; I figured that the government would just reverse the laws and clawback the taxes. But that didn’t happen. In fact, all of the incentive laws have survived a change of administration, and the new administration has expanded them even more. The tax incentives have also held up in court as well, so they’ve really been tested thoroughly. 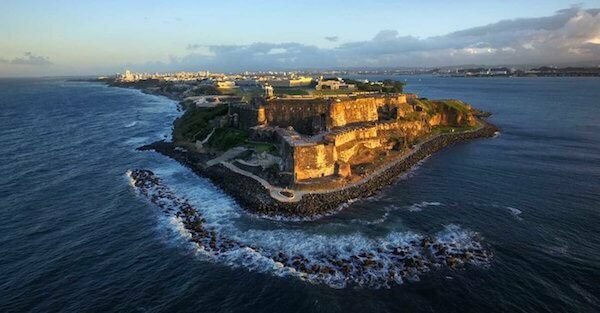 What’s interesting about Puerto Rico right now is that the island has been in a heap of trouble. Starting in August 2015, the government began a wave of defaults on official debt; total obligations, including government bonds, related debt, and pension liabilities, is about $140 billion. That’s a lot of money in Puerto Rico; the size of the entire economy here is just $105 billion… so the liability is incredible. This debt crisis has caused a significant recession over the last several years. The Hurricane Maria came in and basically wiped the place out. It took months just to restore power to most of the island… and they’re still not at 100%. Between the storm and the long-term economic morass, locals have been leaving the island left and right. Several hundred thousand people moved away just in the second half of last year, and the population has fallen by more than 10% since 2000. But that’s not what they did here. In Puerto Rico they doubled down on the tax incentives– expanding them, making them more attractive, and working on cutting rates for ALL workers and businesses. We had some of the most senior officials from the government at our event– including the Acting governor and several key cabinet secretaries, literally passing out business cards making personal invitations to our investor group. Their message was clear: Puerto Rico is open for business. There are challenges, but also a tremendous amount of opportunity. And they’re willing to work hard to make sure that talented people have access to those opportunities… and can KEEP what they EARN. The senior ranking politician on the island, in fact, told us privately that he views himself as a Libertarian, and his goal is to cut regulation and shrink the size of government. So far their efforts are working. Thousands of productive people have already come to the island through the various tax incentive programs. And the Secretary of Economic Development and Commerce told us that applications are up 200% year over year. This is a VERY good trend that should create more economic activity, more jobs, and more wealth for everyone. Peter Schiff came to the event as well; he’s an old friend of mine and also has a similar business in Puerto Rico, and he talked about his experiences living and doing business on the island. He also made some interesting points about Puerto Rico’s debt. The media makes a big deal about the fact that Puerto Rico has so much debt. And it does. But who has even more debt than Puerto Rico? The United States of America. At $21 trillion, the US national debt is FAR larger than Puerto Rico’s. And if you add America’s unfunded pension liabilities (according to the Treasury Department’s own data), the total debt is $70 trillion. That’s over $200,000 for every man, woman, and child in America. Yet in Puerto Rico, the per-capita obligation is about $45,000. Puerto Rico is getting all the bad press right now for its debt crisis. But it’s only a matter of time before the world realizes that the US federal government is in far worse shape.